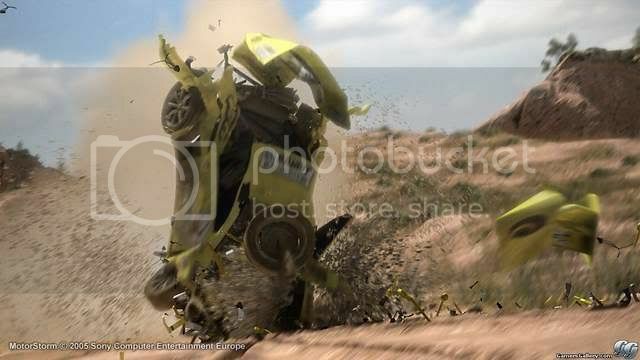 We've been told all sorts of things about MotorStorm. To begin with it was simple: cars, bikes, buggies and trucks will drive around big tracks set in Monument Valley. Then there was all that stuff about persistent terrain detail: tyres cutting through mud would leave appreciable dents and grooves that buffeted your suspension on subsequent laps, while hoardings would splinter and smash under the weight of an unseated motorcyclist hurtling against them, and leave troubling debris. There was talk of AI opposition reacting badly to engagement, nudging you into a ravine when the opportunity next arose. And of course there was that trailer at E3 two years ago, which aimed to convince us all that as well as about 48 million transistors, Industrial Light & Magic lurked within the RSX graphics chip, the run-over from their birthing of the next generation of videogame visuals splashing the walls of desire with automotive ejaculate. And you know, some of it's true. The persistent terrain detail works as advertised, the AI doesn't like to be mistreated, and as much as it'll pain some of you to read it, MotorStorm does look amazing. At times the brownest game since Quake, the detail's still incredible, with every flavour of special effect dancing merry hell around the frame buffer. It's like a graphical rave - textures are photographic, if not always bump-mapped; the cars' glossy intricacies muddy and fray delightfully under the weight of incessant grinds, nicks and flecks; dust and mud-showers cloud your third- or first-person perspective; and the draw distance is phenomenal, with tracks like Rain God Mesa designed to emphasise this with huge crescent roads along mountainsides, or massive jumps, while Rockhopper goes even further, clear as day for further than, in real life, my eyes can reliably see anyway. It's also probably the only videogame aesthetic that sits comfortably within the aural cocoon of Nirvana's Breed, among other raucous accompaniment. Indeed, that CG trailer may not have been literal, but it was evocative - of a game that leaves you enjoying rather than bemoaning somebody else's definition of cool. But anyway, none of that's a reason I particularly like MotorStorm. Those are just neat little bonuses. I like it because it's the first racing game in ages to realise that you don't need 487 tracks; you just need a few really good ones. I like it because it's the first racing game in ages to realise that you don't need 487 cars; you just need a few really good ones. I like it because it's the first racing game in ages to realise that you don't need endless modifications, inversions, reversals, reversions, diversions, or excursions to other genres; you just need a simple, straightforward series of excellent races. And I like it because it's the first racing game in ages that actually got why SSX was good. I'd half forgotten about SSX, but Evolution hasn't. So much bears comparison. The tracks, of which there are surprisingly few, are immense, taking several minutes to lap, and they're multifaceted. The handling, which varies depending on your mode of conveyance, is never less than perfectly in tune with the adjustments you make with the analogue stick (or, if you can be bothered to master it, the tilt control). This is no game of driving to the end of the road and going left. It's about constant adjustment as you're buffeted by the terrain, angling your buggy, car or whatever to cushion your landing whenever you're rocked free of the ground. It's about using the handbrake and the boost buttons as much as the clutch, because traction's at a premium and momentum's often your biggest foe. Every race has the endless need to compensate of a rally game, along with the depth of choice and epic scope familiar to fans of the first two, long-form SSX games. Across a race's three laps, you'll probably struggle to remain in first position, but the challenge isn't directly attributable to tough opponents; more it's a matter of driving yourself well and finding the right route. If you fall behind, pulling yourself level may involve navigating the perillous and often aerial path to a better route - finding a cliff mantle from the trail of mud you're wallowing in, or navigating a narrow gully - and doing so is risky but immensely rewarding, like dancing between hails of rock-shaped bullets into the arms of a winning lottery ticket. It's the racing genre's closest thrill to the violent ballet of a martial arts sequence, and something only a few games have ever done well, SSX being one. Burnout managed it at times too, and there are superficial comparisons to be drawn here also. 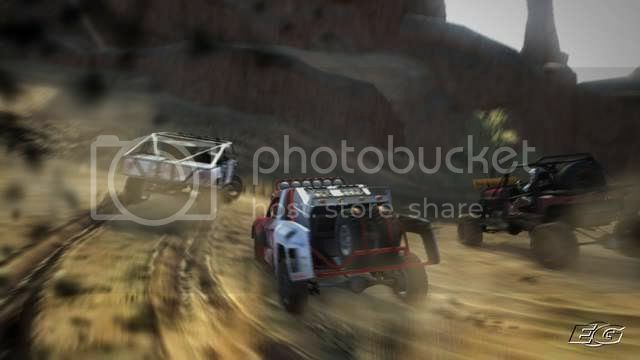 MotorStorm's furious terrain is always pecking at you, trying to bite your wheels off, and your vehicle is visibly tatty after a while even if performance is unimpaired. But make solid contact with anything or roll significantly, and you'll likely explode in a slow-motion, head-beneath-the-water moment of depressing failure. Often it's an exclamation point to pre-empt the tirade of abuse you'll rain on the game's "unfairness" (although you'll know it's not actually unfair), but it can also be quite a showpiece - played with a friend, I realised that pausing the game and wiggling the right stick allowed you to spin the camera around and marvel at the scene. Pointless but fancy. Respawning, you're robbed of speed but reimbursed with cool: as in, your temperature meter is reduced to zero, so you can boost again. Boost plays a huge role, with a likeable flame effect, but its real joy is risking a last burst just as it's about to push you beyond the red into detonation: literally exploding over the finish line to nick first at the end of a 15-minute race is uniquely satisfying. Well, it would be if SSX didn't have a similar thing. But this doesn't feel particularly derivative and comparisons with other games are only drawn to persuade. You shouldn't be put off by the relative paucity of tracks and modes, either, nor the slower general pace; MotorStorm's brand of physical, technical racing is still exceptional in a number of respects (not least of which is that it's a PlayStation 3 game I've felt like playing when the working day's disappeared). There are some niggles, like the occasional explosion when you graze a transition between dirt and rock that veers toward inexplicable, and there'll be concern over its directness, I expect (online is being withheld for the Western launch in March, with not even split-screen available in Japan), but the fact I've not felt the need to topload that detail with boundless negativity ought to be telling. Ditto the occasional dip in frame-rate, most typically associated with bunching over the start-line, and largely irrelevant in a game where the real fun is not speed, but control. 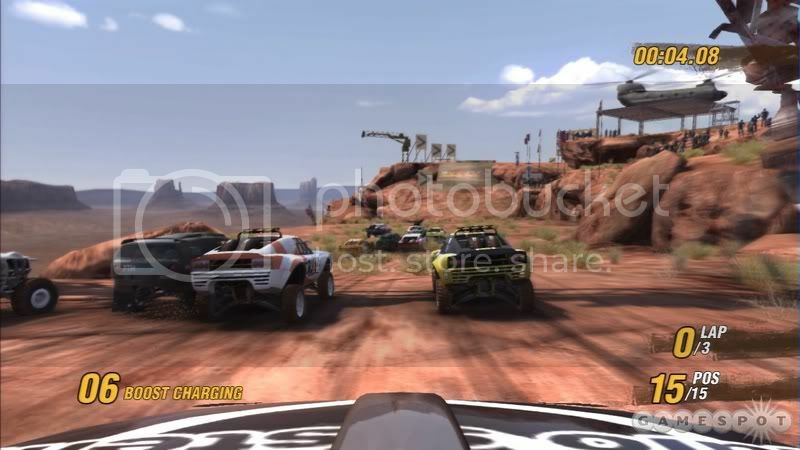 So yeah, we've been told lots about MotorStorm. So let's be excited about the fact that it still manages to feel incredibly fresh, immediate and exotic, in spite of its notoriety. Bolstered for its European release, it ought to be a classic, but right now it's simply excellent. only complaint so far has been the lack of modes(splitscreen,vs,online) and a lack of speed for some while comparing with burout(what game is faster than burnout),and the single desert setting. 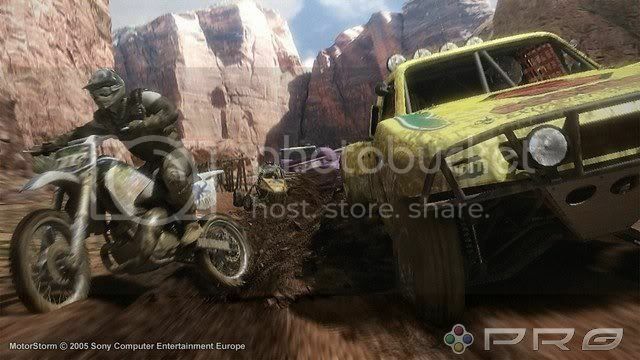 I played Motorstorm on demo PS3 consoles at Circuit City and it does indeed look great especially on an HDTV. However I can easily imagine a 360 game doing the same quality visuals... nothing as jaw dropping as say Crysis for the PC... or GOW when you saw it for the first time. PS - Whats the name of the show in headlines today? @umang:the show on headlines today is "cybernet". 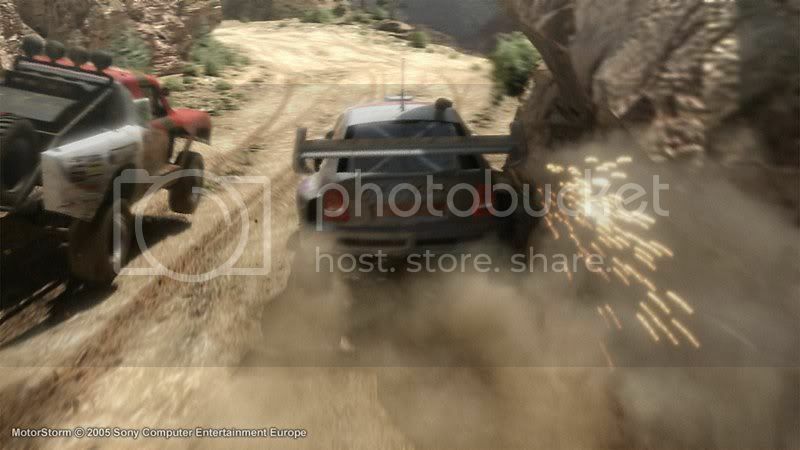 for all racing fans who want gr8 graphics wait for gran turismo 5 ,supposedly each car is taking them around 6 months to model and considering how their previous works went ,this one will have a big hand in ps3's world dominance,if it actually happens.